Unveiling liberal hypocrisy, corruption, and lack of common sense. 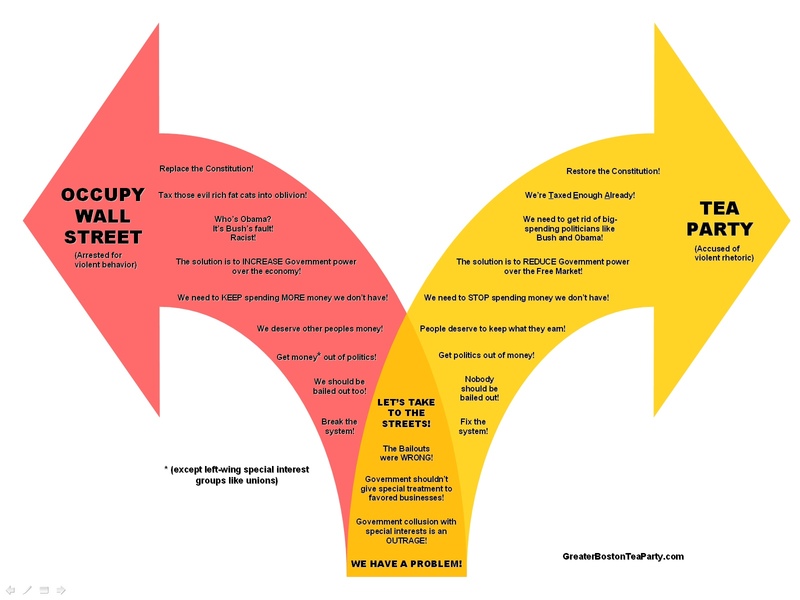 The graphic above does not accurately represent the OWS movement. It contains lies. I support the truth even more than I support OWS. The creator of this graphic is not being truthful. I have some corrections. “Replace the constitution” is not true. “Tax the evil rich fat cats into oblivion” should read, “Let the Bush tax cuts expire”. “Arrested for violent behavior” should read “arrested for peacefully protesting”. “Who’s Obama? It’ Bush’s fault! Racist!” should read,”thirty years of Reagonics has failed us”. “We need to keep spending MORE money we don’t have” should read “we should spend more wisely”. “We deserve other people’s money” is not an OWS platform, it is an accusation of OWS and the left in general. “Get money out of politics” is accurate. “We should be bailed out too” is not an OWS platform. “Break the system” should read “the system is broken”(in agreement with the tea party). The jab at unions with the asterisk* is an opinion. The unions are not special interest groups and they have lost the battle for the middle class over the past twenty years. I’m just saying. Don't have time to frisk a liberal? Click to subscribe to this blog and receive notifications of new posts by email!